Helps homeowners conserve water and reduce water bills. Measures 22W x 16 x 32H. Features removable debris screen. 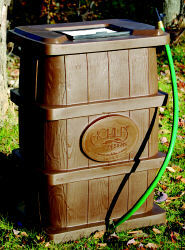 Built-in 4 foot hose with thumb valve stores neatly in slot at top of the barrel. Made of durable, UV-stable polyethylene. Link two or more together in seconds. A foolproof linking kit is included with every barrel, so you can add capacity as your garden expands. Link two or more together in seconds.